After several years of perfecting recipes, they finally launched the company and started selling online. 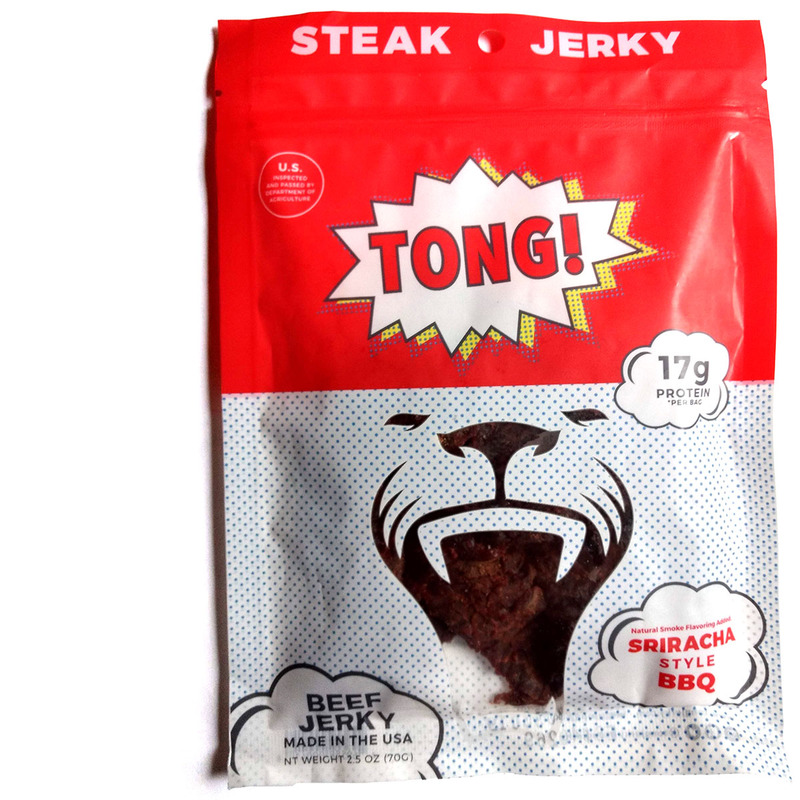 Their jerky can also be found in a handful of stores across Los Angeles. This Sriracha Style BBQ is described by the company as, "for those like it a bit hotter", going on to say that it's a, "perfect combination of classic BBQ sauce with a spicy chili twist". The first flavors that I identify is a sweet BBQ sauce with a light spiciness. The chewing brings on some tangy worcestershire, along with touches of vinegar and garlic. 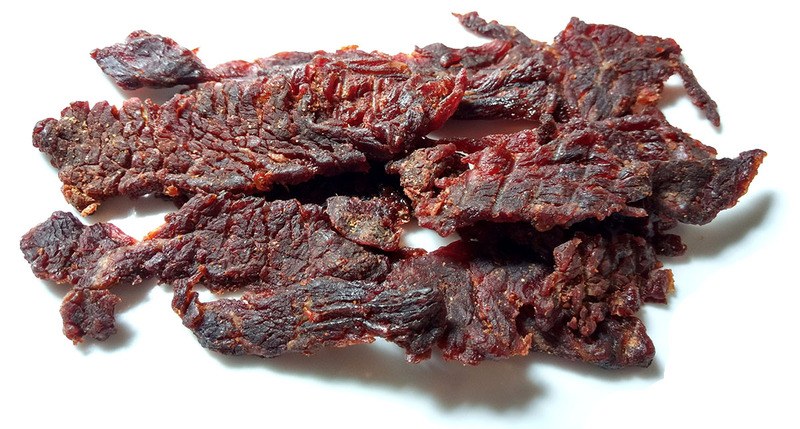 There's a light natural meat flavor towards the end. For being named, "Sriracha Style BBQ", it doesn't really have a Sriracha flavor, aside from a light spicy heat. However, it does have a BBQ-like flavor, mostly something based on worcestershire and soy sauce. Think of this more like an Asian-style BBQ sauce, with a tangy dashes of vinegar, but with some added heat and garlic. As for that heat, it's light, but enough rate as, "mild medium" (level 2 out of 5) on our heat scale. Otherwise, the primary taste profile is a savory blend of soy sauce and worcestershire, well-sweetened up, tangy with vinegar, and a light level of chili pepper heat. The meat consistency is excellent. 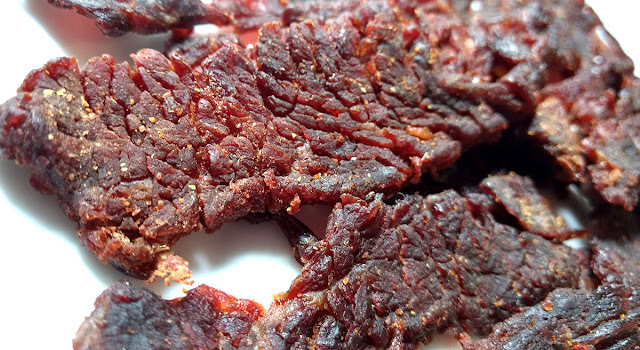 These appear to slices of brisket, with a light level of stringiness, but chewing easily with a semi-moist feel. They take on a very meaty, steak-like texture. This Sriracha Style BBQ variety from Tong Jerky creates a lot of chewing excitement with its sweet, tangy, and savory blend of soy sauce, worcestershire, rice wine vinegar, and chili sauces. While it's not outwardly Sriracha in flavor, it has enough of its peppery heat to make this Asian-style BBQ blend jiggle and dance. The semi-moist slices of beef are easy to chew and take on steak-like texture. Overall, the addicting flavor and tender chewing both make this entry palate-perking delight.